Boost Mode - Selected whenever the microprocessor senses the battery voltage is very low. Boost Mode provides a higher charging voltage that rapidly brings the battery up to 90% of full charge. The digital display will show the word BOOST when the charger is in this mode. Storage Mode - Activated automatically when the 12 Volt systems are turned off and the battery has been fully charged for a period of 30 hours. The digital display will show the word STORAGE when the unit is in this mode. Normal Mode - Automatically selected once the battery reaches the 90% charged level. This lower voltage safely completes the charge and the unit will remain in this Normal Mode as long as the 12 Volt systems are being operated. The digital display will show the word NORMAL when the unit is in this mode. Exclusive Equalize Mode - Prevents battery stratification and power robbing sulfation. When the charger is in the Storage Mode, the microprocessor automatically equalizes the battery by increasing the voltage from 13.2 Volts to 14.4 Volts for 15 minutes every 21 hours. This higher voltage remixes the electrolyte mixture of water and sulfuric acid. Battery manufacturers recommend that Lead-Acid batteries be equalized every 30 days or 10 discharge cycles. 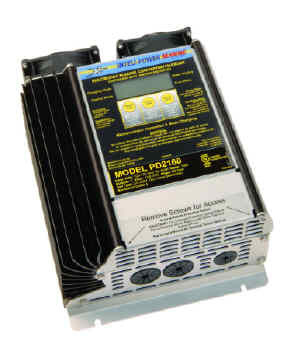 Digital Meter - Displays Current, Voltage, Operation Mode, Blown Fuse Indication, and Battery Type. 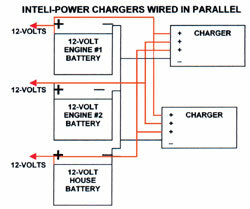 Inteli-Power Converter/Chargers can be connected in series to provide a combination 12/24 Volt system, or in parallel to provide more current (as shown below). Weight 5.8 LBS. 5.9 LBS. 6.3 LBS. 6.4 LBS. 9.2 LBS. * Fan controlled by temperature sensor normally operates only during high load or high ambient temperature conditions. 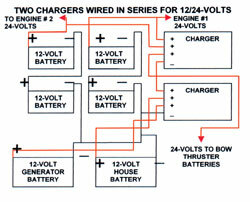 All output voltages are +/- 0.3 VDC and specified for lead acid type batteries. All voltages are 0.4 VDC lower for gel type batteries.